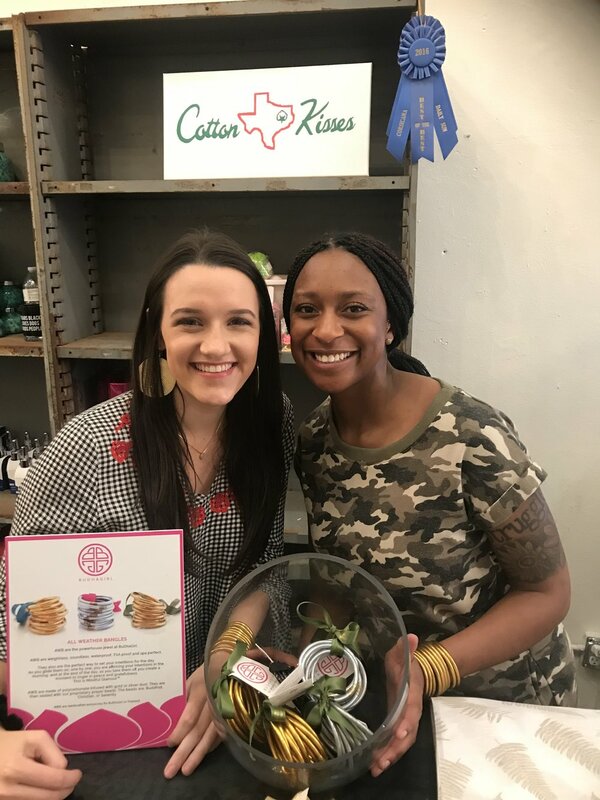 Today we're introducing you to Rockie Glicksman, owner of Cotton Kisses boutique in Corsicana, TX. Cotton Kisses boutique is a destination for all things casual, chic and fabulous. Just a short drive from the DFW Metroplex, Cotton Kisses offers their customers the latest and greatest in women's fashion trends from apparel to footwear and accessories. BuDhaGirl: Tell us about Cotton Kisses Boutique! Rockie Glicksman: I have always wanted to own a clothing boutique. I love fashion and shopping! My husband helped me make my lifelong dream come true in January 2016. We bought a building in downtown Corsicana and remodeled it. RG: We love that BuDhaGirl jewelry is beautiful, functional and purposeful. BDG: What fashion and accessory trends are you noticing for spring and summer? RG: Rose Gold is huge for spring, which makes me so happy! I want Rose Gold everything. Even my 7-year-old daughter is obsessed with the baby All Weather Bangles! RG: The All Weather Bangles are our favorites. The Cotton Kisses Girls wear them daily. At a white elephant gift exchange, with my friends, we took a picture wearing them with our awful, furry fingerless gloves. BDG: Why is mindfulness, ritual and intention important to you? How do you practice these things daily? RG: We are all so busy with work, family and life, in general. BuDhaGirl reminds us to be mindful about our attitudes and to love with intention. Follow Cotton Kisses Boutique on Instagram and Facebook! See something you like? Shipping available! Posted on February 21, 2018 by Jessica Jesse and filed under Inspiration, Lifestyle, Mindfulness and tagged cotton kisses featured store mindfulness.